Waiting can be an excruciatingly difficult process, especially if you are a 5-year-old. If you scourge the Internet for parenting-related sites, you would understand that one of the banes of modern childhood is an ultra-short attention span and the inability to focus on anything for a prolonged period of time. The problem has been projected to be so critical that doctors do not hesitate to put kids on medications for ‘attention deficit’. So much has been written about the problems of a one-year academic cycle for young children, which results in an almost-four-year-old sitting with a nearly-five-year-old in the same class room. The difference in demeanour and mental maturity cannot be more pronounced than the cliched ‘chalk and cheese’. Now that developed countries have started talking about these issues and are trying to find solutions, it would probably be another decade before the developing nations start understanding these implications in schooling. I’ll stop my schooling rant here. This image was taken a few months ago when my son was waiting with his tennis-class friends to meet one of the stars of the Sony Ericcsson WTA year-ending tennis championship. This is one of the longest times I have seen him wait in one place. The kids were all fidgety with every minute of delay in the program, but later had a ball of a time when Vera Zvonareva walked in to play with them. Zvonareva has a way with kids and she puts in so much of time promoting tennis among them. 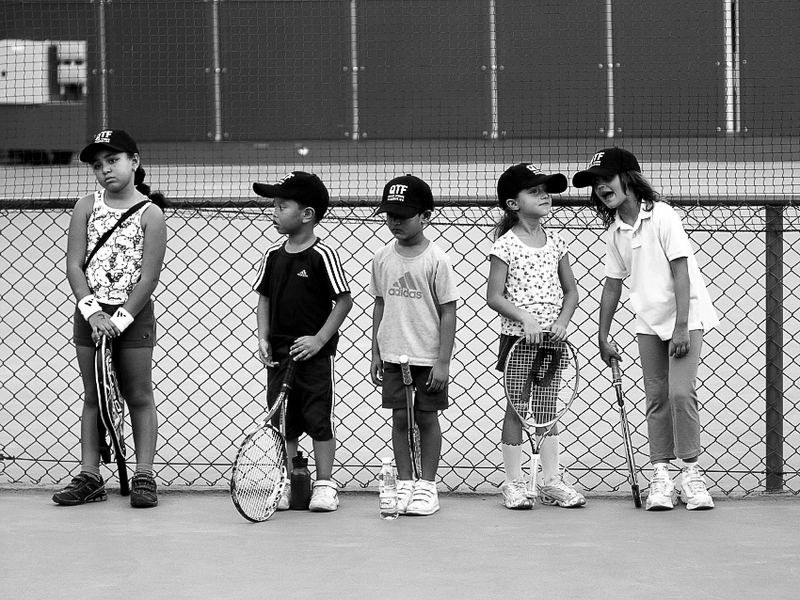 The kids were all thrilled playing with a grand-slam finalist.